Remarketing through Facebook means showing ads on Facebook to people who have previously been on your site. It used to be that you had to use a third party company on the Facebook Exchange to buy those ad placements (for example, AdRoll was a big one), but now you can do it easily yourself! Last week Facebook announced the ‘Social Graph’, a beta project allowing better search of information stored in Facebook. This means that not only will you get better, cleaner results when you are searching for people you know, you will also be able to find people with certain interests, and/or find information about people who like certain things. E.g. 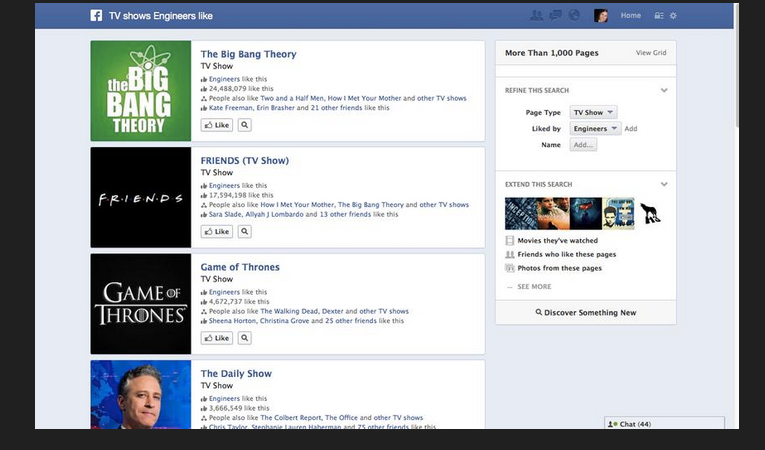 in the example below, Mashable has done a search for “Tv shows that Engineers like”. Supposedly, nothing private will be made public to help these results – it is just improving the current search capability. However, having said that, Facebook is a prolific changer of privacy rules – so who knows what could happen next? – Individuals can use this feature to find things they like, in a “if you liked this, you’ll love that” kind of way. – You can find people who like the same things you do (but then, see cons for next step). – It offers a new opportunity for marketers, allowing them to see how likes and interests are related, or the tastes of certain demographics. While marketers might not be able to extrapolate this information right now, Facebook has done a great job of showcasing the potential capabilities. – Amid increasing privacy concerns of Facebook users and the Instagram ownership debacle – will Facebook have trouble encouraging its users to keep liking things now that people know there is an increasingly powerful search function which can be used on all this data? – Once you find people who like the same things you like – how would you connect? Why would they accept you? Facebook is mostly a closed network for friends, especially with increased privacy concerns. – Optimise your ‘About’ section, as you would for search (i.e. balance between optimising for users and robots). For market researchers, there just opened up a tantalising opportunity for future data mining. While it is unlikely that Facebook would let them have this info for free, I can imagine it being integrated into the Facebook Ads interface. Or maybe you will be able to buy information on the different demographics or interest groups. Facebook has shown that it has the potential. For ad buyers it will be interesting to see the next step of this development – monetisation. Marketers would be very interested to see ad purchasing available on such searches. Wondering why the reach of your Facebook posts have fallen? Blame it on EdgeRank. EdgeRank is the name of Facebook’s algorithm which ranks objects in your Facebook feed – kind of similar to how PageRank ranks pages in Google’s search results. Pages with higher EdgeRank are more likely to show up in a news feed. While Google says their algorithm has over 200 parameters affecting it, Facebook has come out and said there are just three main things which affect your EdgeRank – Affinity, Weight and Time Decay. Affinity depends on the users relationship with the post in their news feed. If you visit a page a lot, comment or like their things often – then your affinity with them is higher, and their posts will be in your feed more often. Therefore, to increase Affinity, you have to encourage engagement, likes and visits to your page. That is, the answer to increasing EdgeRank affinity is the same as what you should be aiming to do all along – write great, engaging content that people love! (Ok, that’s easy, right?). Weight is determined by the type of post (e.g. photo, link, text, etc). Not everyone has the same weight on the same objects. E.g. some people like photos better, others like links or videos. However, it seems to be accepted knowledge that some kinds are better for most people than others – e.g. most people will prefer photos to text updates. What would you rather have in your feed? Time Decay simply means that as a post gets older, it loses value, and EdgeRank decreases. EdgeRank kind of flew under the radar for a long time, until a big change in September 2012 resulted in a significant fall in reach for many businesses. Months prior to the change, Facebook had introduced the concept of paying to promote your posts. Both individuals and businesses were prompted/asked if they wanted to pay a cost to increase the reach of any comment/photo/link they posted. A few months later, Facebook made a big change to their EdgeRank, which significantly reduced the normal reach of a pages posts. Many accused this reduction of free reach (with the opportunity of paying to increase the reach) of being a bait and switch of epic proportions. However, Facebook easily rebutted this accusation by saying that EdgeRank aims to make their users feeds more relevant to them – excluding excess commercial and irrelevant posts. This argument falls down, however, when you realise you can pay to get included in peoples feeds anyway. (Kind of like when Google started blocking natural search terms in Google Analytics to protect peoples privacy – however they happily give you those terms when you buy them via Adwords). Of course, Facebook is a business, and they need to make money for their shareholders. Perhaps (obviously?) their previous monetisation efforts weren’t cutting the mustard, so rather than introduce a new feature, they thought they would take something people were already enjoying, and make them pay for it. It’s a classic move, and it is probably necessary for their business – but of course it is going to get a few noses out of joint. The only way to deal with this is to think about your EdgeRank when crafting your posts – just like you would think about SEO factors when creating your web pages. Social Media just got a little bit more technical. Looking for a spark to ignite your digital marketing strategy? MooMu Media provides expert digital marketing advice to help promote your business online, no matter where your customers are or what language they speak. Our clients love working with us because we are the digital marketing partners you can trust – Owner operated, passionate about online, with a particular strength in optimising sites for international audiences. MooMu Media is a Certified Google Adwords Partner and is Microsoft Advertising Accredited.